Photo by Patrick Sue-Chan for SpeedwayMedia.com. 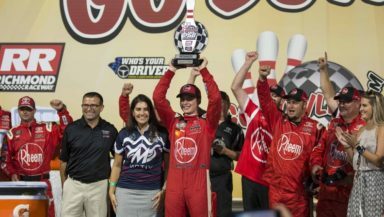 The NASCAR Xfinity Series held their first race of the championship Playoffs at Richmond International Raceway Saturday night for the Go Bowling 250, and one driver got one step closer to the championship trophy. Christopher Bell, piloting his No. 20 Joe Gibbs Racing Toyota, captured the win and earned that first Playoff spot moving him on to the second round. Bell took the lead from fellow championship contender Matt Tifft late in the race on what was the final restart of the night. Last week’s winner, Ross Chastain, had another great run in his final race driving the No. 42 Chip Ganassi Racing Chevrolet. He finished the night in the runner-up spot. Coming in third place was fan favorite driver Daniel Hemric in his No. 21 Richard Childress Racing Chevrolet. Making the night of racing even more exciting was the return of Dale Earnhardt Jr. to the track. Earnhardt Jr. came out of retirement to run tonight and dominated much of the race, even capturing his first Xfinity stage win in Stage 2 of the event. He brought his No. 88 JR Motorsports Chevrolet home in fourth. Rounding out the top five was Tifft as Elliott Sadler, Tyler Reddick, Brandon Jones, Shane Lee, and Reed finished sixth through 10th, respectively. Stage 1 ran flag to flag without any cautions. Regular season champion Justin Allgaier proved strong as he, Hemric, and Bell all battled for the lead. Bell would come out on top and win the stage. Stage 2 slowed the pace for one caution period when Ryan Reed got into the bumper of teammate Ty Majeski sending him hard into the wall. Bell and Hemric fought each other for the lead, however, late in the stage, Earnhardt Jr. took the lead from Bell to score the stage win. The driver on the move was Chastain after his pit crew told him that it was time to go. The final stage had a few caution periods, most of which were minor. However, the race end came a little early for Allgaier after Cole Custer got into the back of him and spun him around. Earnhardt Jr. saw his win slip away when he lost the lead on the final pit stop of the night. Bell took the lead with 13 laps to go and didn’t look back until he took the checkered flag. The Playoff leaderboard has Bell in first place with 2090 points, and moving on to round two with his win. Hemric is in second with 2062 points, Allgaier is third (2056) and Chastain is fourth with 2053 points. Elliott Sadler (2051), Tifft (2047), Tyler Reddick (2046) and Brandon Jones (2035) round out the top eight Playoff contenders. The Xfinity Series heads to Charlotte Motor Speedway next week on Saturday, Sept. 29.